Amish typically do not become doctors and nurses, but they do help save lives in other ways. For one, there is the Amish involvement in fire companies, particularly in Lancaster County, but not only there. Miriam’s journey to EMT started when God called her. “In January 2016, an ambulance came past our place on State Route 93,” she explained. “God came in a still small voice and said ‘You should go and become an EMT.’” Miriam immediately dismissed the idea. There was no way that an Amish person could become an EMT. However, her father attended a meeting of the Swiss Valley Joint Ambulance District in February that year. “When he came home, he said ‘They are looking for some Amish to be EMTs’,” she said. To that point, Miriam hadn’t shared what God had said to her. In March though, that all changed. Through conversation with her family, it finally came out that she really wanted to be an EMT. The last hurdle was her Dad’s approval. It ended up not being a hurdle at all though. “I don’t care, if that is what God is calling you to do,” Jason told her. The women, aged 25 and 24, both felt the calling. Karen adds that “I have always wanted to do medical…So, doing EMS was a good start.” Since excelling in their EMT class and passing the national exam, they’ve been working as EMTs for a year and a half now. It’s a brief article so doesn’t go into a lot on what it is like being Amish and an EMT. By the photo above, you might even wonder if the girls are Old Order Amish – I’m saying that mainly based on the head coverings on the girls, which is not visible for one sister (could be the camera angle) and quite small for the other. However their dresses certainly look Amish and some Amish, particularly in the Midwest, do wear alternate hair coverings like the kerchief. Karen and Miriam have a passion for their work and are looking to go further in the field – with paramedic and nursing as possible options. “We care about the people in the community…We want to be there for them if they are hurting” says Karen. The Gordonville Fire and Ambulance Association is primarily a volunteer agency that serves the heart of the Amish country. When a call for a fire or EMS is received, a siren is sounded, and a non-Amish member of the department will drive a predetermined route to pick up the Amish members on the way to the station. The system seems to work well. The fire trucks have enlarged cabs to carry the extra manpower (often five to six members)—a necessary feature because the Amish can’t drive. The service has three ambulances—one of which is staffed 24 hours a day, with the others being reserve units (but almost always available for back up if needed). Staffing during the day includes part-time paid staff and volunteer members. Gordonville typically responds to 800–1,000 calls a year. Most providers are EMTs. Despite the seeming limitations of such a system, the members are amazingly up-to-date on current EMS practices and controversies. We talked about various EMS issues, including IV fluids, helicopters and trauma care. I noted numerous issues of JEMS around the station and a copy of my paramedic text, Essentials of Paramedic Care open on the kitchen table with class notes nearby. At the end of my visit, a soft-spoken and blushing Mennonite member asked me to autograph her book. Another article dating to 2012 notes that church acceptance of EMS involvement has increased. We posted here this spring about a controversy about Amish EMTs and firefighters using motorized scooters to respond to calls faster. 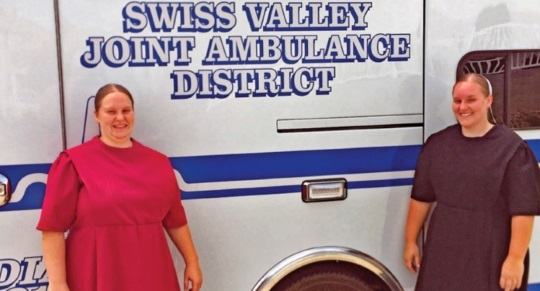 Back in 2007 I also wrote about catching up with an Amish EMT in the same community as the Schlabach sisters, shortly after he had responded to a call following a car-buggy collision. While limitations on formal education preclude Amish from becoming doctors and surgeons, some are still active in caring for other’s health and safety though their work as EMTs and firefighters. It’s always neat to see articles like this one on the Schlabach sisters, and I hope they continue to follow their calling – we certainly need people with their talents and passion for helping others. A picture of Amish people? Just curious why they allowed their photos to be taken? I thought the Amish do not like to have their pictures taken. What an awesome article to see Amish people becoming EMT’s so they can help others. I have always been interested in family history my mother was born in Holmes county and shares the same last name, but has always been difficult to track ! We know we are descendants of Christian Schlacbach and Magdalena Schwartzentruber.